Pharmacy Technician Guide ranked the professional certification preparation course at No. 2. 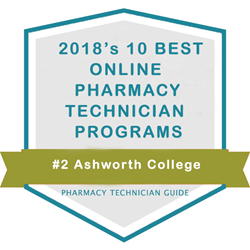 The online Pharmacy Technician Career Diploma program at Ashworth College is one of 2018’s 10 best US-based online programs of its kind according to Pharmacy Technician Guide, an independent online guide edited by experts in the fields of education, career training, and pharm tech. To read the complete List of the 10 Best Online Pharmacy Technician Programs in the Country - Academic Year 2018 in its entirety, please visit http://www.pharmacytechnicianguide.com/Best-Online-Pharmacy-Technician-Programs.html. Ashworth College launched its Pharmacy Technician Career Diploma program with professional certification prep in 2012. An externship was added to the curriculum in 2014, providing students opportunities to get hands-on experience through partnerships with Walgreens and CVS pharmacies nationwide. To date, nearly 10,000 students have graduated from the career training program. Learn more about the program curriculum, tuition, and included professional certification exam options by visiting http://www.ashworthcollege.edu/career-diplomas/pharmacy-technician. Ashworth College is a nationally-accredited online institution that provides flexible and affordable education to students located around the world. Areas of study include more than 125 career-focused programs in the high-demand fields of healthcare, technology, business, creative services, education, legal studies and trades. Since its founding 30 years ago, more than 300,000 students have graduated from Ashworth College with diplomas, professional certificates, associate, bachelor’s and master’s degrees. In a 2016 survey by the Distance Education Accrediting Commission, 95 percent of graduates said they were satisfied with their studies and would recommend Ashworth College to a friend. For more information, visit https://www.ashworthcollege.edu.